And it’s Friday! Happy Canada Day weekend everyone! Here’s hoping the rain in the Nation’s Capital goes away! Today, I’m sharing the reveal of my entrance. If you’d like to read the journey, click here to read Monday’s post. So, this is the paper that I ultimately decided upon. It took awhile to get in and I just managed to get it up just before my daughter’s shower…phew. That was a close one. I originally was going to do all the walls, but time was short and I just managed to do the one large wall. And now, I’m thinking I may just leave it as is….hmmm. 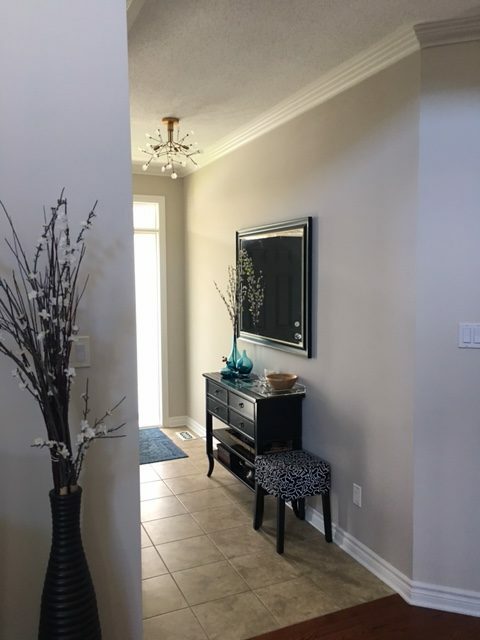 The entrance was painted in Benjamin Moore’s Picket Fence (a soft and warm grey) a few months ago, which picks up on the grey veining in the floor tile. It has looked like this for a few months. Soooo boring!! And now it looks like this! So much better! I also changed out the entry light, wall sconces and ceiling fixture this past winter when I was doing a little house refreshing. Introducing the soft greys and taupes makes the house feel fresher and more contemporary. In an ideal world I would change out the entry tile but that will not be happening. The blue vase and entry mat pick up on the navy in the dining room, living room and upstairs loft. 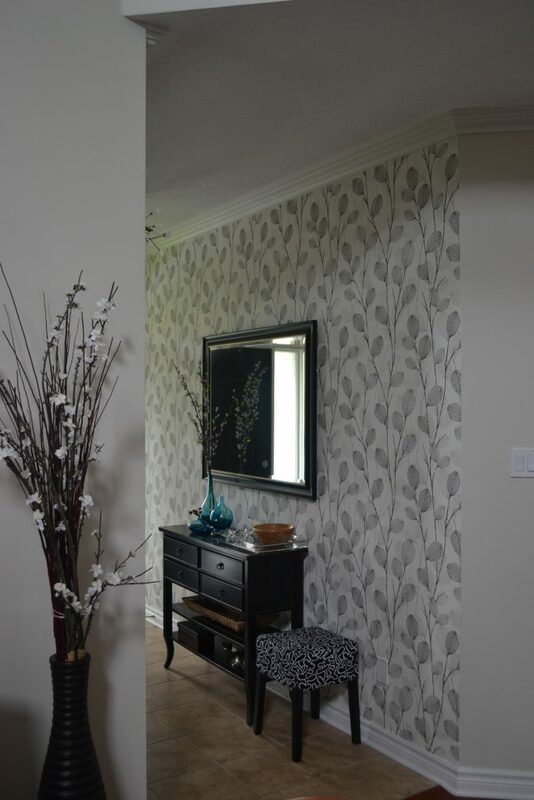 So leave as is or continue the wallpapering on the remaining entry walls? 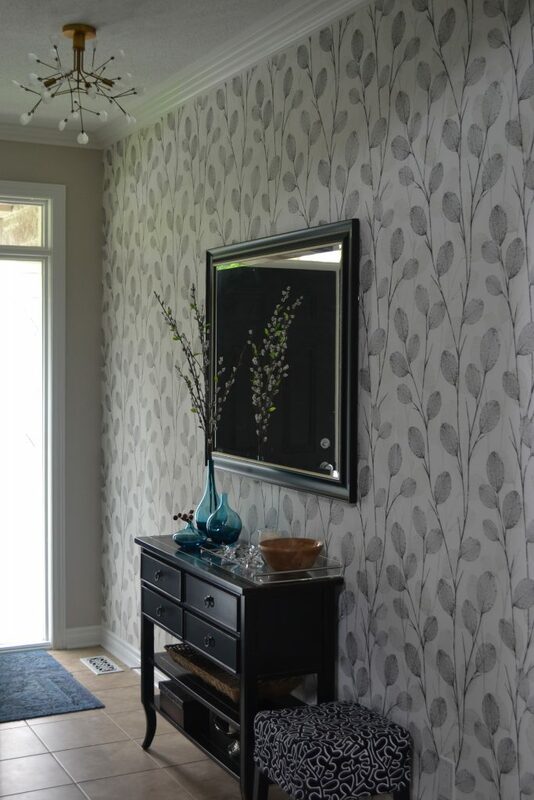 Way back a few months ago, I was posting on IG and FB a few of the wallpaper options that I was looking at for my entryway. I had been going back and forth on what exactly I wanted. 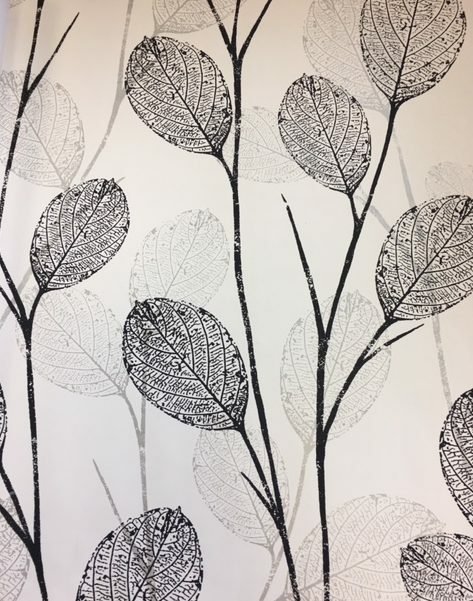 I originally was looking at navy and white and I definitely wanted some sort of natural theme, leaves, flowers, trees… However, since we are thinking of selling at some point in the future, I wanted something that appealed to most people and wasn’t too out there. 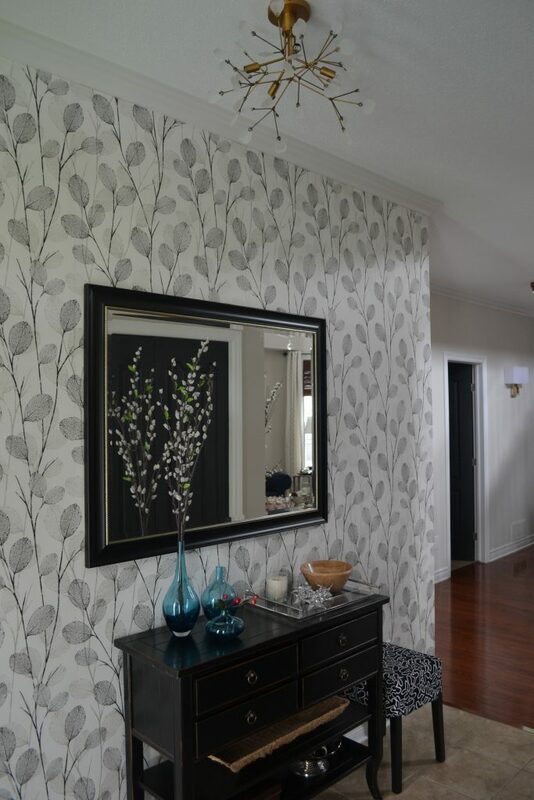 Then I decided to do the One Room Challenge, which of course, totally side railed me on the wallpaper selection. So you can definitely see my nature theme going on above. Each one has it’s pluses and minuses. Top left is modern and the grey has a slight metallic tone so it’s also a little more formal. Top right is soft, calm and has a watercolour feel in person. Bottom left has a linen texture and is again calm and neutral. 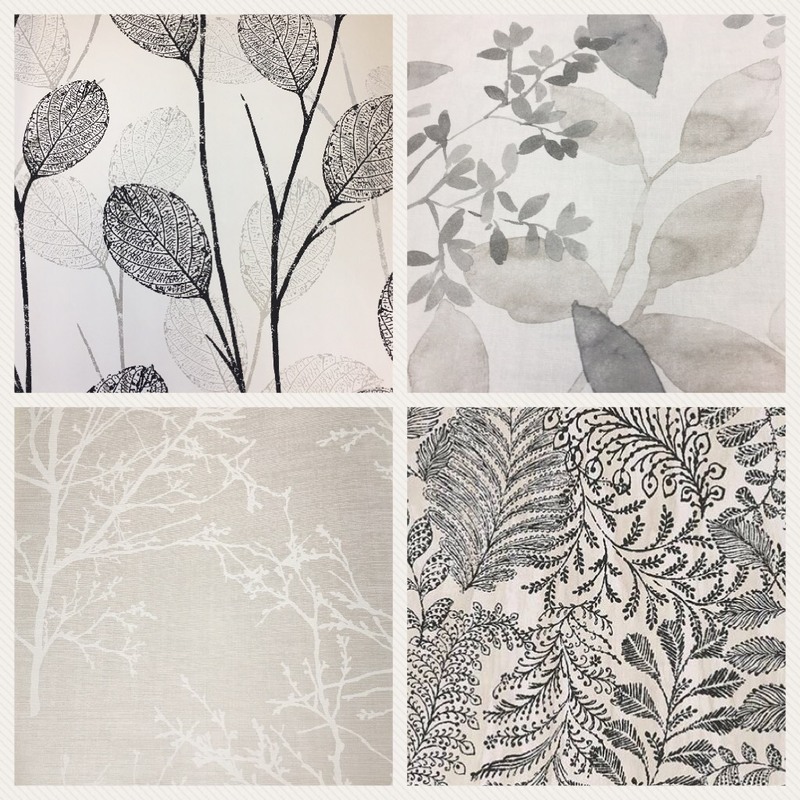 Bottom right is similar to a block print and has a casual Scandinavian feel. After I stencilled and painted the interior doors a charcoal/black. I did love the stencil but then I had the house painted just before Christmas and the stencil was painted over. 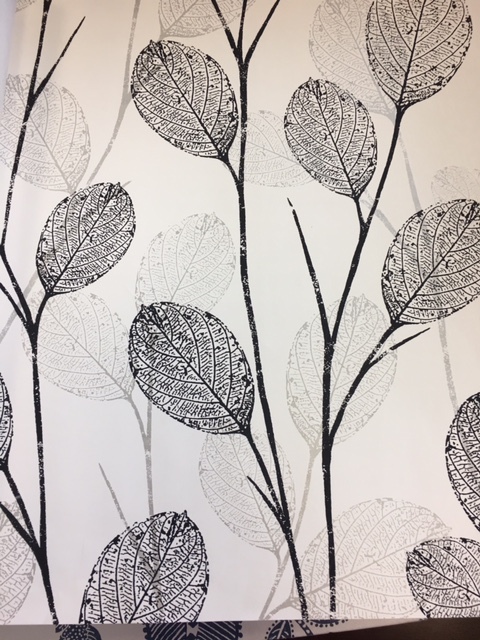 So back to the drawing board or in this case, the wallpaper store. Since I had already done a stencil I wanted something different so wallpaper won out. 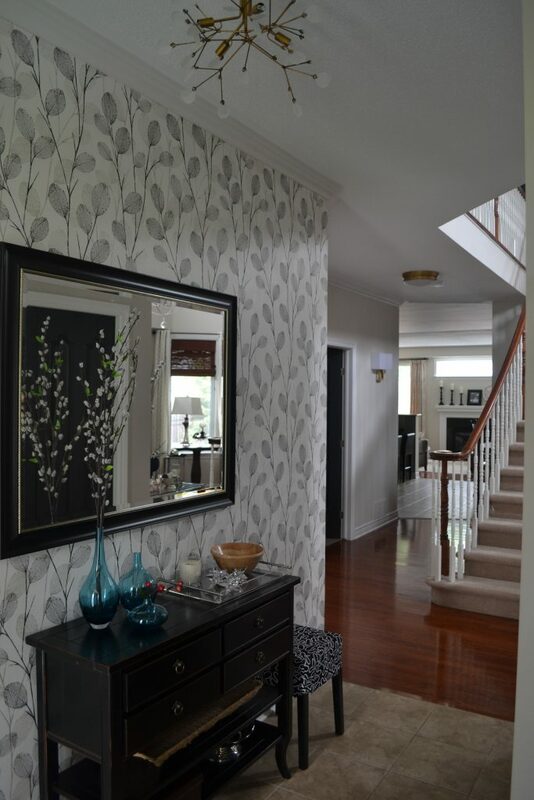 This is how the entry looked after a fresh coat of Benjamin Moore’s Picket Fence. Fresh and clean but just a little dull. And which paper was the winner, you ask? I’m a sucker for trees and leaves and I thought this one had the touch of greige/taupe that would work with the existing beige/taupe fixtures. I’ll be posting the reveal later this week. Yikes, only one week left and I’m scrambling a little. So to recap, I’m a guest participant in the One Room Challenge, where bloggers link up and share the challenge of completing their one room transformations in a mere six weeks. A big thank you to the creator and organizer of the ORC, Linda at Calling It Home and her partner, House Beautiful and of course, you for following us all along. If you haven’t already be sure to check out the 20 featured designers and my fellow linkers as they share their inspirations, challenges and next week, the final reveals! For all my inspiration and how I got this far, you can read the previous weeks’ posts by clicking the links below. Thankfully, I got quite a bit accomplished this week. 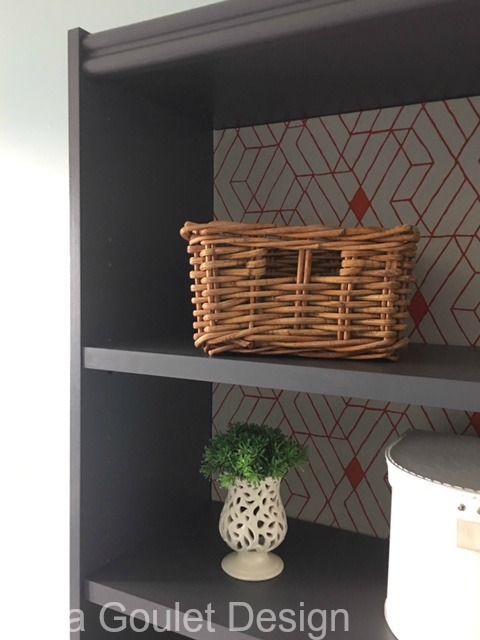 The biggest job was getting the bookcase painted and wallpapered. Which I completed late last weekend and I’m so pleased with how it turned out. This is how it looked when I started. I first painted it with Benjamin Moore’s Grey 2121-10, which matched the Ikea’s Alex drawer unit I’m using in the room, perfectly. Then I used Hygge & West’s Quilt wallpaper in Cayenne for the back of the bookshelf. And it now looks like this! It still needs to be styled but isn’t she pretty? wiped it with a damp cloth to get the dust off, and then let it dry. 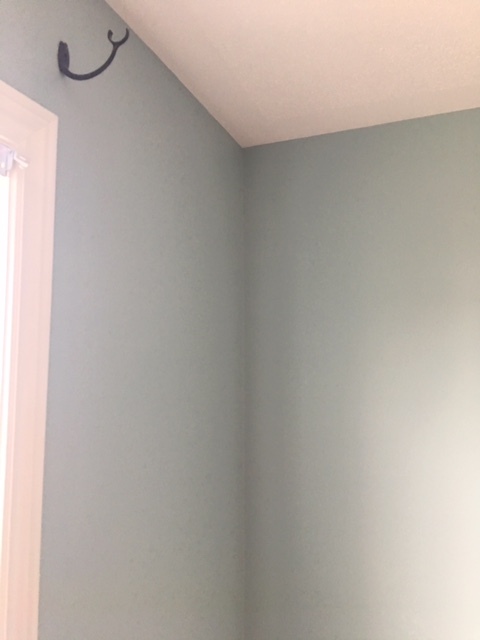 I used Benjamin Moore’s Advance paint for furniture and trim in a pearl finish and gave it two thin coats with a sponge roller. 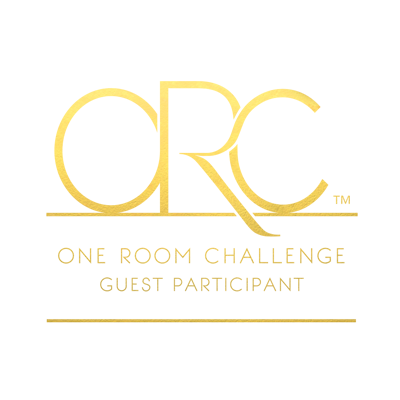 I did use a good quality brush for the corners. Let it dry well between coats and I gave it a good two days before I put anything on the shelves. The wallpaper had to be pasted, which I prefer as it doesn’t get gluey water everywhere and that was the best scenario as the back of the shelf is just a thick cardboard. It was tricky to wallpaper as it wasn’t completely flat and it has creases in it. But I did the best I could, and I think it turned out really well. 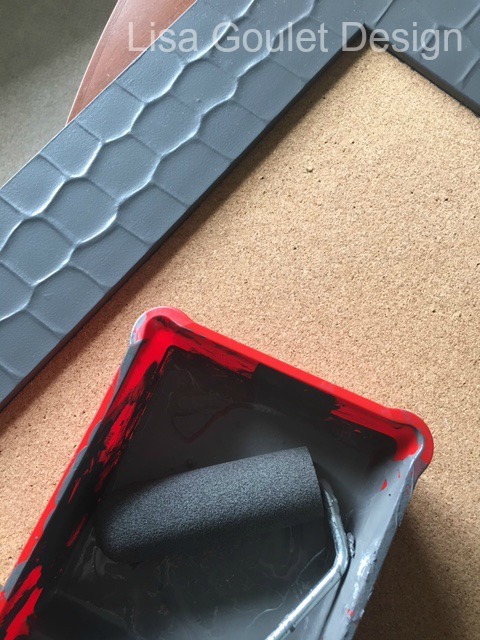 I’m hoping the paint holds up okay, since I didn’t use a primer. Time will tell. The finish looks really good in person, so I’m crossing my fingers. My fabric samples/remnants are all nicely hung up in the closet, so now I can actually see what I have. I really love this idea. The really big pieces that weren’t on a roll, have been placed in a large wicker basket I have. Ikea’s Alex rolling drawers have been filled with wrapping paper, ribbon, sewing and craft accessories. I love that it’s on wheels so that it can be moved around the room as needed. But my most favourite thing in the room is the drapery. Honestly, I can’t believe how beautiful the fabric looks against the turquoise walls. To think, they started off as a Pottery Barn duvet cover. I spent some time taking it all apart and measuring twice or maybe three times 😉 It ended up working perfectly for the length I needed. I also had some black out lining from some old curtains that I sewed into the panels, to give them some weight. Black out wasn’t really needed for this room, but I love that it allows the panels to drape better. I kept them really simple, as I was doing them myself, and just hemmed them, so they are really just a big rectangle. I already had the drapery rod and the rings so I just hung the panels from the rings, just at the edge of the window moulding, as I didn’t want them to block any light from coming into the room. And in my humble opinion, they totally make the room. I’m currently working on the bulletin board which is shaping up nicely. I did a blogging no no and forgot to take a before pic, but trust me this bulletin board frame was a dark brown when I started. 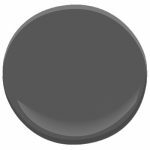 I originally was going to paint it black to go with the Ikea Ranarp sconces but then I changed my mind and did it in the same grey as the Alex unit and bookcase. The plan is to cover the cork with a chevron patterned fabric in turquoise and ivory and trim it out in a matching ribbon. After this I need to finish with the organization solutions and of course, style the shelves, put up the light fixtures (I can’t wait to see that done), hang the art and do a little clean up before it’s photographed next week. Well this week has been a bit of a challenge! To recap, I’m a guest participant in the One Room Challenge, hosted by Linda at Calling It Home. Bloggers link up and share the challenge of completing their one room transformations in a mere six weeks. You can follow the featured designers here and my fellow linkers here, as they share their inspirations, challenges and of course, the results. For the previous weeks’ post click the link below. I’ve actually been away in Florida for the past week, hence the challenge. So I am scrambling a little to catch up. 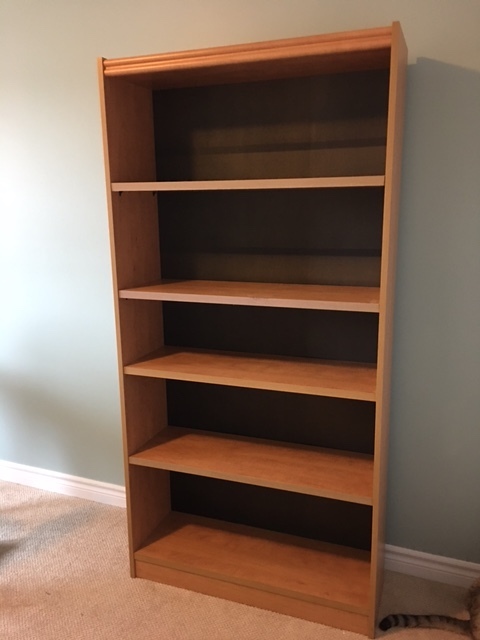 I am planning to start my bookcase makeover, this week and it will entail some paint and wallpaper. Yes, this is where I’m using the Quilt wallpaper from Hygge & West. And yes, that is Milo’s tail in the corner of the pic. He loves to photobomb. 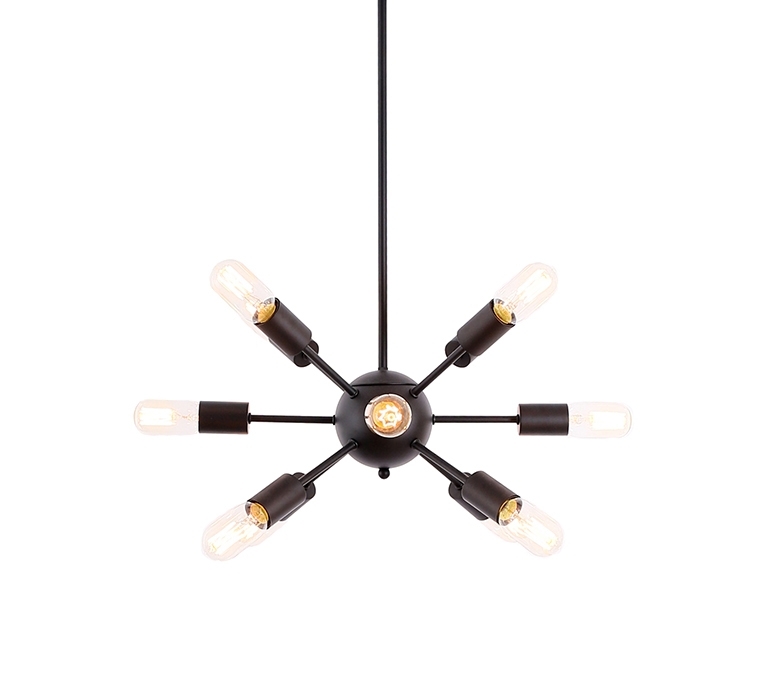 I also had some fun getting the light fixture, when I went to order it from my regular lighting supplier, it was discontinued….what? and they didn’t have any in their warehouse….sob. So after a little more sourcing I found a very similar one at Zone in the market and luckily they had one in stock. I was off like a shot to pick it up. I just have to pick up the proper bulbs and get hubby to install it for me and that can be checked off the list. So this week’s objectives, paint the bookcase, light fixture installed and get the drapes finished. Wish me luck! Thanks again to Linda for organizing and House Beautiful for partnering up. So, it’s already Week 2 of the ORC and to recap, I’m a guest participant in the One Room Challenge , which was started a few years ago by Linda at Calling It Home. Bloggers link up and share their one room transformations that they are attempting to do in a mere six weeks. You can follow along the featured designers here and my fellow linkers here, as they share their inspirations, challenges and of course, the results. For last week’s post click the link below. 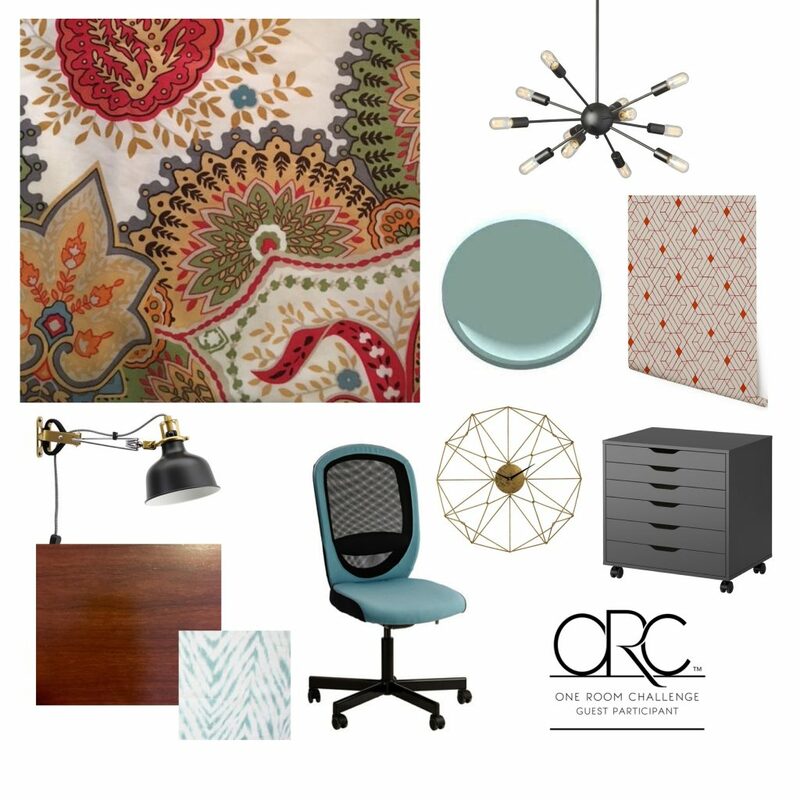 I’m sharing my mood board for my sewing/craft room this week and a few other updates as well. If you follow me on Instagram, you may have already seen some of what I’ve been up to this week. So this is a little design lesson in my choice of fabric and the inspiration it provided for the room. 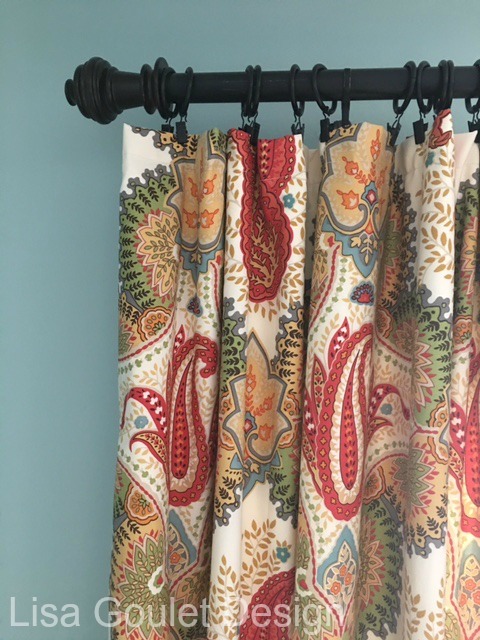 Starting with the paisley fabric, which by the way was actually a duvet cover I found in the clearance section of Toronto’s Pottery Barn last fall. 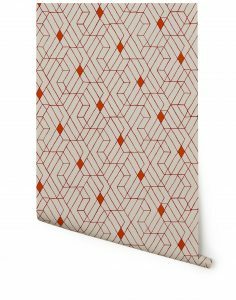 It was exactly what I was looking for, a fabric with a fun pattern that had the orangey, rusts in it to coordinate with the existing orangey wood tables that I had. Because I wanted a warm/cool mix in the room, it was easy for me to pull the turquoise out of the fabric to use as a wall colour. The turquoise office chair was a totally serendipitious find at Ikea yesterday. It was labeled “last chance” on Ikea’s display wall and when I went to the furniture pick up aisle, it was the last one! And it is exactly one shade darker than the wall colour. Totally meant to be! I love the gold wall clock that I’ve shown here, but unfortunately it’s out of stock at All Modern, until June….sob. So if anyone knows of a similar one, please let me know. And why did I choose gold for the clock, well it repeats the bit of gold in the two light fixtures and the golden yellow in the drapery fabric. See there is a reason why every item is selected. I also picked up a few storage items at Ikea yesterday, which I’ll share next week. And my luck was still holding, when my painter called on Monday to say that because of a delayed job, he was available to start this week. Woot! So this is happening now!